In its Weekly Report On Israeli Human Rights Violations in the Occupied Palestinian Territories for the week of 18- 23 Oct. 2012, the Palestinian Center for Human Rights (PCHR) found that 4 members of Palestinian resistance groups were killed and 9 others were wounded in the northern Gaza Strip. Israeli forces used force to disperse peaceful protests organized by Palestinian civilians in the West Bank. Dozens of protesters sustained bruising and suffered from tear gas inhalation. In the Gaza Strip, on 22 October 2012, Israeli forces killed 1 Palestinian man and wounded 2 others, when an Israeli warplane launched a missile on a group of members of the al-Qassam Brigades, military wing of the Hamas movement. The group was on Qleibo Hill, east of Sheikh Zayed city, south of Beit Lahia in the north of the Gaza Strip. On the same day, Israeli forces killed 1 member of a Palestinian resistance group and wounded a second, when an Israeli warplane launched a missile on a group of members of the Salah Eddin Brigades, the military wing of the Popular Resistance Committee. The group was on al-Ashqar land on Sultan Abdul Hamid Street, northwest of Beit Hanoun in the northern Gaza Strip. On 23 October 2012, Israeli forces killed 1 member of a Palestinian resistance group and wounded 4 others, whose injuries ranged from moderate to serious. Israeli soldiers positioned at the northeastern border of the Gaza Strip launched a ground-to-ground missile on a group of members of the al-Qassam Brigades, the military wing of the Hamas movement. The group was launching rockets towards Israeli towns from farming land to the east of al-Salateen Square in Beit Lahia in the northern Gaza Strip. On the same day, another member of al-Qassam Brigades was killed and 2 others were seriously wounded by an Israeli airstrike. The al-Qassam Brigades were launching home-made rockets towards Israeli towns from Beit Lahia in the north of the Gaza Strip. In the context of shooting incidents, on 19 October 2012, Israeli forces positioned along the border fence, east of al-Bureij refugee camp in the central Gaza Strip, opened fire at a group of volunteers from the Local Initiative and a number of Popular Resistance activists. The volunteers and activists were on farming land belonging to the al-Tartouri family, supporting the family as they attempted to harvest olives. As a result, the volunteers and residents of the area were terrified and fled fearing for their lives. On 22 October 2012, Israeli forces stationed inside watchtowers at the border fence, north of the Agriculture School, north of Beit Hanoun in the northern Gaza Strip, opened fire at the farming lands and houses adjacent to the border. Neither casualties nor damage to property were reported. In the context of targeting fishermen, on 19 October 2012, Israeli gunboats stationed off al-Waha resort, northwest of Beit Lahia in the north of the Gaza Strip, opened fire sporadically at Palestinian fishing boats. As a result, fishermen were terrified and fled fearing for their lives. On 20 and 22 October 2012, Israeli forces again opened fire on fishermen. On 22 October 2012, Israeli navy forces abducted 4 fishermen 2 kilometers off al-Sudaniya shore, north of Gaza City. Additionally, their fishing boat was confiscated. In the Gaza Strip, on 22 October 2012, Israeli forces conducted 3 limited incursions into the north and south of the Gaza Strip. The first incursion was conducted at approximately 08:10, as 7 military vehicles moved 500 meters into the northeast of Beit Lahia in the north of the Gaza Strip. Israeli forces began leveling lands and sporadically opened fire in the area. 20 minutes later, the military vehicles moved to the west and stationed at Khayal land, north of the Agriculture School, while warplanes were flying in the sky. Neither casualties nor damage were reported. The second incursion was conducted at approximately 09:25 when 3 tanks and 2 bulldozers moved 400 meters into Abu al-Kas, east of Jabalia in the northern Gaza Strip. Israeli forces began leveling lands in the area. On 23 October 2012, Israeli forces supported by military vehicles moved approximately 300 meters from al-Sreij Gate into al-Qarara, northeast of Khan Yunis in the south of the Gaza Strip. Leveling and bulldozing acts were conducted and fire was opened sporadically before Israeli forces withdrew at 11:00. No casualties were reported. The illegal Israeli-imposed closure of the Gaza Strip, which has steadily tightened since June 2007, has had a disastrous impact on the humanitarian and economic situation in the Gaza Strip. The illegal closure has caused not only a humanitarian crisis but a crisis of human rights and human dignity for the population of the Gaza Strip. Recently-declared measures to ease the closure are vague, purely cosmetic and fail to deal with the root causes of the crisis; the root causes can only be addressed by an immediate and complete lifting of the closure, including lifting the travel ban into and out of the Gaza Strip and the ban on exports. Palestinians in Gaza may no longer suffer from the same shortage of goods but, as long as the closure is allowed to continue, they will remain economically dependent, unable to care for themselves, and socially, culturally and academically isolated from the rest of the world. Israeli forces conducted 40 incursions into Palestinian communities in the West Bank, during which they abducted 5 Palestinians. Israeli forces established dozens of checkpoints in the West Bank. At least 1 Palestinian was abducted at military checkpoints in the West Bank. In one example of this week's incursions, on Thursday October 18th. At approximately 19:00, Israeli forces moved into al-Nwei’ama village, south of Jericho. They patrolled the streets for some time and later withdrew. No arrests were reported. Around the same time, Israeli forces moved into Raboud village, southwest of Dora, south of Hebron. They patrolled the streets and later withdrew to reposition at the road between the villages of south of Dora and Bypass No. 60. They later withdrew and no arrests were reported. Around the same time, Israeli forces moved into Abu al-Ghozlan village, southwest of Dora, south of Hebron. They patrolled the streets for some time and later withdrew from the village to reposition at the road between the villages of south of Dora and Bypass No. 60. They later withdrew and no arrests were reported. At approximately 20:00, Israeli forces moved into Ezna village, west of Hebron. They patrolled the streets for some time. A number of Palestinian boys gathered and threw stones at the tanks in which the soldiers were fortified. The soldiers fired stun grenades in response, as well as tear gas bombs aimed at dispersing the stone-throwers. Israeli forces later withdrew and neither injuries nor arrests were reported. Israeli forces have continued settlement activities in the West Bank, and Israeli settlers have continued to attack Palestinian civilians and property. At approximately 10:00 on Friday, 19 October 2012, a group of settlers from "Carmel" settlement attacked civilians from Kharbet Um al-Khair near the aforementioned settlement, southeast of Yatta, west of Hebron. In his testimony to a PCHR fieldworker, Ibrahim al-Hathalin said that at least 3 settlers began throwing rocks at civilian houses and uttering abusive words against the Prophet Mohammed, while another settler stripped completely in front of the civilians. He added that the civilians called the Israeli police in "Kiryat Arba" settlement, who came to investigate the incident and took a number of civilians to the police station to take their testimonies and file complaints against the settlers. In a separate testimony, Rateb al-Jabour, Coordinator of the Popular Committee in Yatta, said that Ms Yamina al-Hathalin (67) sustained bruises after settlers threw rocks at her near the village. He also added that the settlers organized a demonstration on the main road next to Kharbet Sousia, east of Yatta, and chanted anti-Arab and anti-Palestinian slogans, such as "Death to the Arabs, leave our lands." At approximately 08:00 on Monday, 22 October 2012, Israeli forces supported by military vehicles and a bulldozer, and accompanied by members of the police force and an officer from the Israeli Civil Administration, stormed the al-Hsain valley area, east of Hebron. They surrounded the houses in the area; a number of soldiers stationed themselves on the roofs of some houses and prevented civilians from leaving their homes. The military bulldozer demolished a 250-cubic-meter water well belonging to Mohammed Yousif al-Ja'bari (44). In his testimony to a PCHR fieldworker, Mohammed al-Ja'bari said that forces from the Israeli police and army surrounded the area and began demolishing the water-well, which is considered the main source of water in the village as it supplies over 40 individuals in the family with water. it was previously bulldozed in 2010. He said that the officer from the Israeli Civil Administration told him that the notice, which is in place restricting infrastructural changes in the area, is not time-specific and can be implemented at any time, as the area is under complete Israeli control and falls under Area C in accordance with the Oslo Accords. Therefore, it is forbidden for Palestinians to make any infrastructural changes in the area without the permission of concerned Israeli authorities. At approximately 2:30 on Monday, 22 October 2012, a group of settlers attacked Abu al-'Asja village, south of Doura, southwest of Hebron, and set alight a Skoda car belonging to Ibrahim Ahmed al-Shawamra (39) while it was parked in front of his house. They also wrote racist slogans on the walls, such as "Vengeance… Sousia." In his testimony to a PCHR fieldworker, Ibrahim al-Shawamra said,"At early dawn hours on Monday, 22 October 2012, we heard a sound outside, as we went outside we saw a car, Subaru, storming out, and found the car blazing with fire. We also saw writings in Hebrew on the walls, "Vengeance… Sousia." We called the concerned Palestinian authorities and the Israeli police who came to the scene and investigated the incident." It should be mentioned that the settlers began forming gangs in "Sousia" settlement, east of Yatta, and have carried out several attacks on Palestinian farmers in villages southeast of Yatta. These settlers had expanded their activities, reaching villages by Bypass No. 60, south of Doura. At approximately 11:00 on Monday, a group of settlers from the settlement outpost "Ramat Yashay," established on lands inside Hebron, attacked farmers with rocks while they were harvesting olives in the al-Rmida Hill neighborhood. As a result, a number of farmers sustained bruises. Israeli forces surrounded the place and abducted Imad Nazmei al-Atrash (21), Jawad Thabet Abu-'Aisha (36), and the international solidarity activist known as "Abu-Sarah" (50) who had been videotaping the attack. 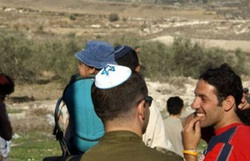 In his testimony to a PCHR fieldworker, Issa Amro, spokesperson of Youth Against Settlement Activity, said that a large number of settlers from the settlement outpost "Ramat Yashay" attacked the civilians while they were harvesting the olive trees in their lands, located near the aforementioned settlement, without any interference from Israeli forces to stop them. Furthermore, they abducted 3 civilians. He explained that Israeli forces had given the Palestinian Liaison a permit for civilians from the Abu-'Aisha and al-Jabali families, allowing them to harvest the olives in their lands. In the West Bank, Israeli forces continued the use of excessive force against peaceful demonstrations organized by Palestinian civilians and Israeli and international human right defenders against the construction of the annexation wall and settlement activities in the West Bank. As a result, dozens of protesters sustained bruises and suffered from tear gas inhalation. Following the Friday Prayer, 19 October 2012, dozens of Palestinian civilians and international and Israeli human rights defenders organized a peaceful demonstration in Bil'ein village, west of Ramallah, in protest to the construction of the annexation wall. The demonstrators gathered in the streets of the village, chanting slogans calling for national unity. The protesters aimed to stress the need to adhere to national principles and the right of return, to resist the occupation and to call for the release of all Palestinian prisoners. The protesters raised Palestinian flags and made their way towards the wall. They called through megaphones for Israeli settlers in “Mitityahu” settlement to leave Palestinian land. Israeli soldiers stationed in the area fired rubber-coated metal bullets, sound bombs and tear gas canisters at the demonstrators. As a result, a number of demonstrators suffered from tear gas inhalation and others sustained bruises; the wounded were treated in the field. Also following the Friday Prayer on 19 October 2012, dozens of Palestinian civilians and international and Israeli human rights defenders organized a peaceful demonstration in Ne’lin village, west of Ramallah, in protest at the construction of the annexation wall and settlement activities. The demonstrators moved towards areas of the annexation wall. Immediately, Israeli soldiers stationed in the area fired rubber-coated metal bullets, sound bombs and tear gas canisters at the demonstrators. As a result, some demonstrators suffered from tear gas inhalation and others sustained bruises; the wounded were treated in the field. Around the same time that Friday, dozens of Palestinian civilians and Israeli and international human rights defenders gathered in Martyrs Square in Nabi Saleh village, northwest of Ramallah, to hold a weekly peaceful protest against the construction of the annexation wall and settlement activities. The protesters walked towards the gate erected by Israeli forces near the entrance of the village, which lead to Palestinian lands that Israeli settlers from the nearby "Halmish" settlement are trying to seize. Israeli soldiers, who had been extensively deployed in the area and near all the entrances of the village since the morning, began to confront the protesters who wanted to walk towards the affected lands. Israeli soldiers fired live and rubber-coated bullets, sound bombs and tear gas canisters at the protesters. As a result, some demonstrators suffered from tear gas inhalation and others sustained bruises. Following the Friday Prayer, Palestinian civilians and international human rights defenders, including Ms Luisa Morgantini, former Vice President of the European Parliament, organized a peaceful demonstration in the center of al-Ma’sara village, south of Bethlehem, in protest at the ongoing construction of the annexation wall. As the protestors moved towards the gate of the village, Israeli forces closed it to prevent the demonstration from gaining access to the confiscated lands. In his testimony to a PCHR fieldworker, Jawad Alaadin, a member of the Public Movement in Bethlehem, said, "Israeli forces stopped the crowd from reaching the lands threatened with confiscation. Israeli forces soldiers and demonstrators engaged in a skirmish after Israeli forces closed the main road." Due to the number and severity of Israeli human rights violations this week, the PCHR made several recommendations to the international community. Among these are a recommendation that, in recognition of ICRC as the guardian of the Fourth Geneva Convention, PCHR calls upon the ICRC to increase its staff and activities in the OPT, including the facilitation of family visitations to Palestinian prisoners in Israeli jails. The PCHR appreciates the efforts of international civil society, including human rights organizations, bar associations, unions and NGOs, and urges them to continue their role in pressuring their governments to secure Israel's respect for human rights in the OPT and to demand Israel end its attacks on Palestinian civilians. On Tuesday 23rd October, Haaretz Israeli newspaper published on its website a survey shows that the majority of the Jewish public in Israel supports the apartheid regime in Israel. According to the survey, those Israelis also refuse to share life with the Arab citizens and call for their expulsion. The Survey shows that 58% Support the Apartheid Regime in Israel, 47% support the expulsion of the Arab citizens from Israel, and 74% wants to separate roads for Palestinians and Israelis in the West Bank. 69% wants a law barring Israeli Arabs from voting for the Knesset and large majority of 69% objects to giving 2.5 million Palestinians the right to vote if Israel annexes the West Bank. In its Weekly Report On Israeli Human Rights Violations in the Occupied Palestinian Territories for the week of 11- 17 Oct. 2012, the Palestinian Center for Human Rights (PCHR) found that 5 Palestinians were killed by Israeli missiles in the Gaza Strip. 2 of the Palestinians killed were extra-judicially executed by Israeli forces. 5 Palestinians, including 2 children, were wounded in the Gaza Strip, while 1 Palestinian man and 1 Palestinian child sustained bruises in the West Bank. In the Gaza Strip, Israeli forces extra-judicially executed 2 Palestinians in the northern Gaza Strip. On 13 October 2012, Israeli warplanes launched a missile on a motorcycle ridden by 2 Palestinians on Mas'oud Street in Jabalia refugee camp, in the northern Gaza Strip. As a result, one of them was killed immediately, while the other died 3 hours later. A child who was in the vicinity of the attack was wounded and the windows of 2 houses in the area were broken. The glass door of a nearby pharmacy was also smashed. Israeli forces acknowledged that they had carried out the attack; an Israeli military spokesperson was quoted as saying that 2 members of Global Jihad had been targeted. On the same day, an Israeli warplane launched a missile at an olive grove, east of al-Bureij refugee camp in the central Gaza Strip. 17 olive trees were uprooted and the missile left a big hole in the ground. In addition, 5 houses were partially damaged. Mohammed Ahmed Ahmed Abdul Salam, 12, was sleeping in his home nearby, and sustained minor bruising on his right leg from flying rubble. On 14 October 2012, Israeli forces carried out the willful killing of a member of Palestinian resistance, when Israeli warplanes attacked 2 men on their motorcycle in al-Fokhari area, southeast of Khan Younis, south of the Gaza Strip. The second man was wounded in the attack. On the same day, Israeli forces Israeli forces carried out the willful killing of two other members of Palestinian resistance, when Israeli warplanes targeted 3 men on farming lands in Wadi al-Salqa village, southeast of Deir al-Balah, the central Gaza Strip. Two men were killed and the third was wounded. On 13 October 2012, Israeli warplanes launched a missile at open land, northeast of al-Nusairat refugee camp, in the central Gaza Strip. The missile left a big hole in the ground. Neither casualties nor damages were reported. On 14 October 2012, Israeli forces positioned at the border fence in the vicinity of Kissufim military site, northeast of Khan Younis, opened fire at lands and neighborhoods in al-Qarara village, west of the aforementioned military site. Neither casualties nor damages were reported. On 16 October 2012, Israeli forces stationed inside watchtowers at the border fence in the vicinity of Beit Hanoun (Erez) crossing in the northern Gaza Strip fired heavily at Palestinian and international protesters, who were on the Khayal plot of land, approximately 400 meters away from the border fence. The 18 protesters, including an international activist and a Palestinian farmer, were under fire for 20 minutes. No casualties were reported. On 17 October 2012, Israeli warplanes launched 5 missiles at a military training site belonging to al-Qassam Brigades, the military wing of the Hamas movement, east of Um al-Nasser Bedouin village, in the northern Gaza Strip. The attack caused damage to a house inhabited by 4 families consisting of 18 members, including 8 children and 4 women, the headquarters of the International Federation of Football (FIFA), Abdul Mohsen Hamouda religious institution belonging to the Ministry of Awqaf and Religious Affairs, and Bisan Entertainment City. In the context of attacking Palestinian fishermen in the open sea, on 12 October 2012, Israeli gunboats positioned off al-Waha resort, northwest of Beit Lahia in the northern Gaza Strip opened fire at Palestinian fishing boats. As a result, fishermen were terrified and fled. Neither casualties nor damages were reported. On the following day, another attack was conducted against fishermen in the same area. Fire lasted for 10 minutes. Neither casualties nor damages were reported. In the West Bank, on 11 October 2012, Hatem Najeh Da'na, 14, sustained bruises and fractures, when he was run over by a vehicle belonging to the Israeli Civil Administration. Da'na was in the yard of the Ibrahimi mosque, in the center of the Old City in Hebron. On 15 October 2012, a group of Israeli soldiers mobilized between Palestinian houses in Beit Ummar village, north of Hebron, attacked Ashraf 'Ezzat Khalil Sabarna, 19, while he and some children were on their way to visit a relative. As a result, he sustained bruising on his hands and leg. During the reporting period, Israeli forces conducted at least 40 military incursions into Palestinian communities in the West Bank. During these incursions, Israeli forces abducted at least 18 Palestinians, including 3 children. In an example of one of this week's incursions, on Monday October 15th, at approximately 03:00, Israeli forces moved into Tulkarm. They patrolled the streets and positioned themselves at Far’aoan Street near al-Safarini Mosque. Israeli forces raided the house belonging to the family of Mahmoud Lutfi Ahmed Abu Theyab, 17, and abducted him. Then, Israeli forces repositioned in the southern neighborhood of the city near the Hawash building and raided a house belonging to the family of Islam Mohammed Nasr Allah, 19, arresting him. Later, Israeli forces also abducted Zeyad Sami Nemer Tamam, 25, and took the 3 detainees to an unknown destination. At approximately 15:00, Israeli forces established a checkpoint at the entrance of Beit Amr village, north of Hebron, during a funeral for a civilian from Beit Amr. A number of boys gathered and threw stones at the Israeli forces and, in response, the soldiers launched stun grenades and tear gas at the boys and the civilians in the courtyard of the cemetery. This resulted in cases of tear gas inhalation. In his testimony to a PCHR fieldworker, Mohammed ‘Awad, media spokesman for the Popular Committee, said that large numbers of Israeli soldiers were seen in the vicinity of the cemetery during the funeral of one of the civilians. This provoked anger and upset amongst the mourners, who clashed with the Israeli soldiers. ‘Awad reported that the Israeli soldiers fired tear gas and stun grenades at the houses of civilians and used several civilians’ cars as shields. It should be noted that this is the second incident this month in which funeral mourners were subjected to Israeli forces attack in Beit Amr. At approximately 20:00, Israeli forces in Beit Amr village, south of Hebron, attacked Ashraf ‘Aezat Khalil Saba Rana, 19, while he and some small children were on their way to a relative’s house. Rana suffered bruising on his hands and his foot and was transferred by Palestinian Red Crescent ambulance to the Governmental Hospital of Hebron to receive treatment. In his testimony to a PCHR fieldworker, Ashraf Sleibi said that while he was accompanying his young cousins to their house, they passed through an area which is continuously full of Israeli soldiers. “Four soldiers stopped me and started harassing me and the young girls and insulted us with the worst embarrassing words then they started attacking us by pushing the girls into the ground for no reason. When I was trying to protect them, the four soldiers brutally beat me and kicked me hard with their feet and their gun butts causing me bruises and wounds in my hand and my left leg. On 10 October 2012, a group of Israeli settlers from "Kedumim" settlement established on Palestinian lands in Qalqilya attacked farming lands in Kufor Qaddoum, on Qalqilya – Nablus road. Furthermore, the settlers stole olives from the farming lands. On 11 October 2012, a group of settlers from "Karmi Tsour" settlement, north of Hebron, moved into al-Bweirah area, where the Najal' Islamic shrine is established, east of Beit Ummar in the north of Hebron, and performed religious rituals inside the shrine and around the Islamic graveyard. On 12 October 2012, a group of Israeli settlers from "Ramat Yishai" settlement established in Hebron attacked Palestinian farmers while they were collecting olives in Tal al-Rumaida area in the center of Hebron. On 15 October 2012, a number of settlers from "Afrat" settlement established in Beit Ummar village, north of Hebron, cut down 15 almond trees belonging to Abdullah Breigith, 50. On the same day, Israeli forces accompanied by settler vehicles moved into the southern entrance of Bethlehem; settlers closed the main road and prevented Palestinians from passing in or out of the city. 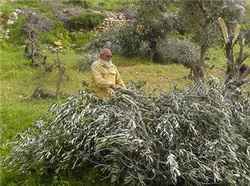 On 16 October 2012, a number of settlers moved into Wadi Abu Risha, west of Beit Ummar in the north of Hebron, and cut down 3 olive trees belonging to Hammad Jaber Salibi, 80. Furthermore, Salibi's brother, Mohammed Abdul Hamid Salibi, 65, was abducted this week while he was working on his land. During the reporting period, Israeli forces used force against peaceful demonstrations organized by Palestinian civilians and international and Israeli human rights defenders in protest at the construction of the wall and settlement activities in the West Bank. As a result, an Israeli human rights defender and a Palestinian child were wounded, and dozens of demonstrators suffered from tear gas inhalation. At approximately 12:30 on Friday, 12 October 2012, dozens of Palestinian civilians and international human rights activists organized a peaceful demonstration in the center of Kufor Qaddoum village, northeast of Qalqilya, in protest to the continued closure of the eastern entrance of the village, which has been ongoing since the beginning of the al-Aqsa Intifada in 2000. After moving towards the entrance, Israeli forces fired rubber-coated metal bullets, tear gas canisters and sound bombs at them. Ahmed Abdl-Fatah Amer (28), Ahmed Wadeei' Amer (21), were abducted and transported to "Qadomim" camp. They were released at approximately 20:00 the same evening. Dozens of demonstrators suffered from tear gas inhalation. Around the same time, dozens of Palestinian civilians and international and Israeli human rights defenders, along with a Norwegian delegation, organized a peaceful demonstration in Bil'ein village, west of Ramallah, in protest at the ongoing construction of the annexation wall. The demonstrators gathered in the streets of the village, chanting slogans calling for national unity. The protesters aimed to stress the need to adhere to national principles and the right of return, to resist the occupation and to call for the release of all Palestinian prisoners. As a result, a number of demonstrators suffered from tear gas inhalation, others sustained bruises and the wounded were treated in the field. Following the Friday Prayer, Palestinian civilians and international human rights defenders organized a peaceful demonstration in the center of al-Ma’sara village, south of Bethlehem, in protest at the ongoing construction of the annexation wall. As they moved towards the gate of the village, Israeli forces closed it to prevent the demonstration from gained access to the confiscated lands. In his testimony to a PCHR fieldworker, Mahmoud Zawahra, a member of the Public Movement in Bethlehem, said, "Israeli forces surrounded the village and prevented the crowd from reaching the farm lands west of town. Israeli forces soldiers and demonstrators engaged in a skirmish, however, no abductions or attacks were reported." At approximately 10:00 Saturday, 13 October 2012, dozens of Palestinian civilians and international and Israeli human rights defenders, gathered in the center of Beit Ummar village, north of Hebron, for the weekly peaceful demonstration organized against the settlement expansion policy, the construction of the annexation wall and the arrest of children. The demonstrators headed towards Thaher Jalis area near "Kermi Tsour" settlement north of the village. A group of Israeli forces soldiers surrounded the demonstrators and attacked them with clubs, bruising a number of them. They were identified as: Youssif Abu-Maria (40), Ahmed Abu-Hashem (46) and Younis 'Arar (42). According to Mr Ahmed Abu Hashem, spokesperson of the National Committee in the village, large numbers of Israeli forces soldiers had surrounded the area since the early morning hours. At approximately 09:20 on Tuesday, 16 October 2012, dozens of Palestinian civilians and international and Israeli human rights defenders gathered in Al-Latron street in Jerusalem, which is called 443 Street by Israeli forces, to hold a peaceful demonstration in protest at the daily assaults against Palestinian civilians by settlers, as well as the annexation wall and the racial discrimination practiced by the Israeli government. The crowd gathered in the aforementioned street, which is used by settlers, resulting in a huge traffic jam. The demonstrators held Palestinian flags and chanted against the Israeli government's policies. Immediately, Israeli soldiers arrived at the scene and attempted to evacuate the street. They fired sound bombs and pepper gas canisters at the demonstrators. As a result, five demonstrators, including an international human rights activist who was not identified, suffered from gas inhalation and sustained bruising. The wounded were treated in the field. Due to the number and severity of Israeli human rights violations this week, the PCHR made several recommendations to the international community. Among these were a recommendation that the High Contracting Parties to the Fourth Geneva Convention fulfill their legal and moral obligations under Article 1 of the Convention to ensure Israel's respect for the Convention in the Occupied Palestinian Territory. PCHR believes that the conspiracy of silence practiced by the international community has encouraged Israel to act as if it is above the law and encourages Israel continue to violate international human rights and humanitarian law. In addition, PCHR calls upon the High Contracting Parties to the Fourth Geneva Convention to convene a conference to take effective steps to ensure Israel's respect of the Convention in the Occupied Palestinian Territories and to provide immediate protection for Palestinian civilians. RAMALLAH, (PIC)-- The Israeli occupation forces (IOF) arrested during the first half of October at least twenty Palestinian children during arrest campaigns carried out in occupied West Bank and Jerusalem, a Palestinian report revealed. The report, issued by the "Child Information Department" in Ramallah, confirmed that the Israeli forces continued to commit more war crimes in the occupied West Bank and Gaza Strip, where they intensified arrests against Palestinian children and used excessive force to suppress peaceful demonstrations, causing injury to dozens of children." 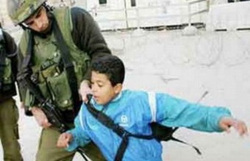 The report, released on Wednesday, stated that over the past two weeks have witnessed the arrest of twenty Palestinian children by Israeli occupation forces and settlers groups, pointing out that most of the arrests were concentrated in al-Khalil and neighborhoods of East Jerusalem. The report said that a number of children in the Gaza Strip have been subjected to Israeli attacks during the first half of October, where five children were injured in the bombing carried out by Israeli warplanes. RAMALLAH, (PIC)-- UN Office for the Co-ordination of Humanitarian Affairs (OCHA) has revealed that the Jewish settlers continued their attacks against the Palestinian farmers in the occupied West Bank since the beginning of the year where they destroyed more than 7500 olive trees. Nearly half (48%) of the agricultural land in the occupied Palestinian territories (oPt) is planted with 8 million olive trees, the vast majority are in the West Bank, the report revealed, adding that the olive oil industry makes up 14% of the agricultural income for the oPt and supports the livelihoods of approximately 80,000 families. OCHA report, issued on Thursday, stated that the olive harvest is an economic, social and cultural important occasion for the Palestinian society, while the occupation authorities deliberately prevented those who own agricultural fields located in the areas between the barrier and the Green Line or near the Jewish settlements in the West Bank to obtain permits allowing them to have access to their fields. 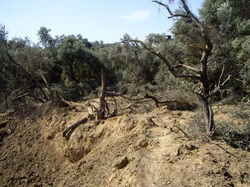 In 2011, 42% of applications for permits to access olive groves behind the Barrier submitted prior to the harvest season were rejected, compared to 39% in 2010, according to the report. In the West Bank, over 7,500 olive trees belonging to Palestinians were damaged or destroyed by Israeli settlers between January and mid October 2012, some 2,000 fewer than during the equivalent period in 2011. Only one of the 162 complaints regarding settler attacks against Palestinian trees monitored by the Israeli NGO Yesh Din since 2005 has so far led to the indictment of a suspect. The Palestinian Centre for Human Rights (PCHR) strongly condemns the assassination, on Sunday, 07 October 2012, of 1 Palestinian man and the severe injury of another. 8 civilian bystanders, including 4 children and 1 woman, were also wounded in the attack. PCHR calls upon the international community to immediately act to stop these actions by Israel’s forces and renews its call for the Higher Contracting Parties to the Fourth Geneva Convention to fulfill their obligations under Article 1 of the Convention to respect and ensure respect for the Convention in all circumstances. According to investigations conducted by PCHR, at approximately 17:10 on Sunday, an Israeli warplane fired two missiles at two men in civilian clothing who were riding a motorcycle, as they were passing by Taha Hussain Elementary School in the Al-Brazil neighborhood, south of Rafah. It should be noted that the attack was carried out at the end of the school day, moments before the students began to leave the school. The targeted persons, Abd-Allah Hassan Mikawy (24) and Tal'at Khalil Al-Darbi (23), both from Rafah, sustained burns and shrapnel wounds throughout their bodies. Their condition was described as critical. Abd-Allah Hassan Mikawy was transported to Al-Shifa Hospital in Gaza City. His leg was amputated but he died of his wounds on Monday evening. Tal'at Khalil Al-Darbi was transported to Nasser Hospital in Khan Younis, where his leg was amputated, according to medical sources. 8 civilian bystanders were wounded in the attack, including 4 children and 1 woman, the mother of 2 of the wounded children. 8- Abdul-Hadi Mahmoud Abu-Mor (56), from Al-Salam neighborhood in Rafah, who was wounded while on his way to the mosque attend Al-Maghreb (Sunset) prayer. Israeli radio quoted military sources, reporting that the raid had targeted two alleged members of the Global Jihad organization. The report alleged that the men were planning a complex military attack in Sinai that was scheduled to be carried out in the coming period. 2- Calls upon the international community to immediately take an action to put an end to such crimes and reiterates its call for the High Contracting Parties to the Fourth Geneva Convention to fulfill their obligations under Article 1 which stipulates "the High Contracting Parties undertake to respect and to ensure respect for the present Convention in all circumstances," and their obligation under Article 146 which requires that the Contracting Parties prosecute persons alleged to commit grave breaches of the Fourth Geneva Convention. These grave breaches constitute war crimes under Article 147 of the same Convention and under Additional Protocol I of the Geneva Conventions. On Sunday, 07 October 2012, at approximately 5.30pm, Israel’s forces launched 2 missiles targeting 2 men on a motorbike as they were passing by Taha Hussain Elementary School in the Al-Brazil neighborhood of Rafah, in the southern Gaza Strip. Subsequently, 1 of the targeted men died of shrapnel wounds, while the other had one of his legs amputated, according to medical sources. 8 civilian bystanders, including 4 children and 1 woman, were also wounded in the attack. Israel’s forces often use airstrikes for extra judicial execution of suspected members of armed groups in densely-populated areas of the Gaza Strip. Israel refers to these as ‘targeted killings’. However, on many occasions such attacks also injure and kill civilians who are in the vicinity of the target. Sabrin Al-Maqousi (23), and her 2 children, Bisan (1 month) and Nassim (2), were wounded in the attack. Her cousin, Jehad Al-Qatrous (27), was also wounded in the same attack. Sabrin lives in Jabalia but she was with her children, visiting her family in Rafah, when the attack happened. She recalls: “My son Nassim was sitting at the entrance of the house when the missiles were launched. I rushed to bring him inside and found that he had already been injured by shrapnel. He just kept saying, “There is some blood on me, there is some blood on me.” Some people came and put him in a car to take him to hospital. Sabrin fears for the safety and security of her children and her entire family. She is both distressed and worried about future attacks and the consequences for her family and loved ones: “When I came back home, I kept crying. I woke up several times that night, fearing that something else was going to happen. I was both angry and sad about what had happened to my family. We had just come to visit my family and have some fun with them, but we ended up wounded. Since the attack, Sabrin says that her constant hope has been for peace and to feel safe once more: “When I saw my children wounded and being taken away, I became psychologically affected. It was almost as if I wasn’t there. You only expect such things to happen on TV, but not to you and your family. I witnessed Operation Cast Lead and I have seen attacks on the tunnels in Rafah, but none of those things scared me as much as seeing my own children hurt. The direct targeting of a civilian object constitutes a war crime, as codified in Article 8(2) (b) (ii) of the Rome Statute of the International Criminal Court. Similarly, under Article 53 of the Fourth Geneva Convention, the destruction of private property is prohibited unless rendered absolutely necessary by military operations. Intentionally launching an indiscriminate attack constitutes a war crime as defined in Article 8 (2) (b) of the Rome Statute of the ICC. Furthermore, according to the principle of proportionality, which is codified in Article 51 (5) (b) of Additional Protocol 1 to the Geneva Conventions, an attack that may be expected to cause incidental loss of civilian life, injury to civilians, damage to civilian objects or a combination thereof is considered excessive in relation to the concrete and direct military advantage anticipated. Professor Yuval Shany selected for judicial body with 112 votes; Says it is 'no trivial matter' that Israeli was chosen for prestigious role. WASHINGTON – Professor Yuval Shany, dean at the Hebrew University's law faculty who was elected to serve on the UN's Human Rights Committee, was celebrating his achievement on Thursday night. Speaking of his new role, Shany praised the Foreign Ministry and Israel's mission to the UN who managed to push the decision after a lengthy diplomatic campaign. "The fact that Israel was elected to a body with so many hostile countries and others, who see Israel as a human rights violator is not a trivial matter," Shany told Ynet. The 43-year old legal expert who was elected with 112 countries voting in favor of the move, is one of nine people selected for a four year tenure by 167 UN member countries who are signed on the international human and political rights convention. The committee has a total of 18 legal experts and they serve as the judicial body that examines whether each country fulfills the international laws on human rights. The body can criticize each member country's activities, but has no authority to pass rulings. It is the second time that an Israeli lawyer is elected to serve on the global body. The first was Professor David Kretzmer in 1995. In contrast to the Human Rights Council which is based in Geneva and which serves as a political body, the Human Rights Committee is a judicial body of legal experts. Its members do not receive a salary and meet three times a year – each time for a three week period, to oversee the implementation of the convention throughout the globe. The committee's role is to ensure that countries which are signatories of the convention do in fact give their citizens basic liberties like freedom of expression, movement and association. "I am very happy to have been selected the role comes with a great deal of prestige but the work itself is interesting," Professor Shany noted. "Israel is a country that often finds itself being criticized by the international community. It is a point of interest with me to examine other countries activities. "Each country must submit a regular report on its activities and as a committee member I can influence committee decisions that are agreed upon." According to Shany: "As an Israeli committee member I cannot sit on committee meetings regarding Israel but I hope I can contribute and help other friends in understanding the special challenges faced by a country like Israel. There is room for criticism but the positive side should also be mentioned." Israeli Ambassador to the UN Ron Prosor said that the development is "an achievement for Israel's delegation to the UN, and a cause for national pride." “It is a testament to the appreciation shown toward Israel and proof that with hard work we achieve impressive results, in spite of the very difficult opening conditions,” Prosor added. In its Weekly Report On Israeli Human Rights Violations in the Occupied Palestinian Territories for the week of 27 Sep.- 03 Oct. 2012, the Palestinian Center for Human Rights (PCHR) found that a Palestinian fisherman was killed, and his brother was wounded, while they were fishing in the northern Gaza Strip. In the West Bank, a child was shot in the foot by Israeli troops. In addition, Israeli forces used force to disperse peaceful protest organized by Palestinian civilians in the West Bank. Dozens of protesters sustained bruising and suffered from tear gas inhalation. Israeli forces conducted 42 incursions into Palestinian communities in the West Bank, during which they abducted 14 Palestinians, 3 of them children, in the West Bank. On 27 September 2012, Israeli forces moved into al-Tabaqa village in the south of Dora, southwest of Hebron. They arbitrarily fired tear gas canisters at the houses of civilians. A gas canister fell into the house of Mahmoud Abu Ras, 52. Israeli forces also harshly beat Khaled Mahmoud Amr, 39, and Amin Isa Abu Atwan, 31. Abu Atwan was wounded in his foot and was transported to Hebron Governmental Hospital to receive the necessary medical treatment. On 01 October 2012, Israeli forces moved into 'Azzoun village, east of Qalqilya. They raided and searched some houses, including a house belonging to Mohammed Abbas Badwan, whose son, Hassan, was abducted. On 02 October 2012, Israeli forces moved into al-Baq'a area, adjacent to bypass road 60, east of Hebron. They raided the 3-storey house belonging to Salem al-Salayma, 50, and resided in by 17 persons. They detained all of the family members on the first floor of the building and did not allow them to move. The Israeli soldiers deployed inside the house and on the roof of the building, and turned it into a military observation point. On 03 October 2012, Israeli forces moved into Beit Ummar village, north of Hebron. A number of boys in the village threw stones at the Israeli soldiers. Israeli forces responded by firing sound bombs and rubber-coated bullets at them. As a result, a Palestinian boy was wounded by a bullet to the foot. Also on 03 October 2012, Israeli forces raided a number of houses in Qaryout village, southeast of Nablus. They photographed the residents and wrote down their names, telephone numbers and mobile numbers, in addition to photographing the houses themselves. After the soldiers withdrew from a house belonging to Abdul Ra'ouf Ali Zaghloul, Zaghloul's wife noticed that jewelry worth an estimated 7,000 Jordanian Dinars (JD) was missing from a small purse in a closet in her bedroom. Israeli forces established dozens of checkpoints in the West Bank. Israeli forces abducted at least 4 Palestinian civilians, including 3 children, at military checkpoints in the West Bank. In the Gaza Strip, on 28 September 2012, Israeli forces shot and killed a Palestinian fisherman and wounded his brother, while they and a group of other fishermen were located a few meters from the shore in the northern Gaza Strip, pulling out their fishing nets. According to investigations conducted by the Palestinian Center for Human Rights (PCHR), at approximately 09:30 on Friday, 28 September 2012, an Israeli infantry unit crossed the northwestern border between the Gaza Strip and Israel, and moved nearly 20 meters into Palestinian territory, along the beach area of the northwestern town of Beit Lahia. Israeli soldiers took position behind a hill at the beach, facing onto a number of Palestinian fishermen who were fishing a few meters offshore. Israeli soldiers fired at the fishermen. The majority of the fishermen were able to flee. However, two fishermen, who were located nearly 15 meters away from the border between the Gaza Strip and Israel, were unable to escape. According to fishermen present in the area, Israeli soldiers fired directly at the two fishermen, wounding them. One of the fishermen died of his wounds later on the same day. On 02 October 2012, Israeli forces positioned inside the watchtowers along the border fence in the northwest of Erez, northwest of Beit Hanoun in the northern Gaza Strip. The soldiers opened fire on a number of workers, who were collecting the rubble of destroyed houses in the area. Following the outbreak of gunfire, the workers fled the area in fear of their lives. Israeli forces abducted 3 Palestinian children from the Gaza Strip who attempted to enter Israel. On 27 September 2012, settlers from "Bitar 'Elite" settlement, established on the lands of the villages of Fokein Valley, Hossan and Nahalin, west of Bethlehem, dumped huge amounts of sewage water onto agriculture lands near Fokein Valley village. According to Ahmad Sokkar, head of the Fokein Valley village council, the sewage water submerged the 50-dunum agricultural lands of Madiq Gate, south of the village. On the same day, a group of nearly 20 settlers from "Brakha" settlement, established northeast of Bourin village, south of Nablus, damaged and cut down more than 60 olive trees, using sharp objects, sticks and stones. The attacked land is the property of Ahmed Abdul-Fatah Falah, and it is located in Bab Al-Thania area, nearly 1,500m from the settlement. On 30 September 2012, settlers began setting up caravans in the territory of Al-Khader town, southwest of Bethlehem. According to Ahmed Salah, coordinator of the Popular Movement against Settlement Activity and the Wall, a group of settlers from "Daniel" settlement, established on the lands of Al-Khader town, led by a settler called Hanania, began erecting caravans in Thaher Ain Qesis area, which belongs to Khader Ali Eissa Abu-Ghalion. On 03 October 2012, Israeli forces confiscated another 4 tracts of farmland near the entrance of Fokein Valley village, west of Bethlehem. According to Ahmed Sukkar, head of the Fokein Valley village council, 4 citizens of Al-Manasra family received an order by the Israeli forces Chief Commander in the West Bank, stating that 75 dunums of their farmland would be confiscated. as a result, the ability to enter and leave the village will be under Israeli forces control, which will increase the suffering of the villagers. On 03 October 2012, Israeli forces took photographs of all Palestinian houses in the Um Rokba area, south of Al-Khader town, south of Bethlehem. According to Ahmed Salah, coordinator of the Popular Movement against Settlement Activity and the Wall, a unit of about 10 military vehicles accompanied by an officer and staff from the Israeli Civil Administration, stormed the Um Rokba area and photographed all the houses in the area. The area is located near the settlement outpost established on the land of Um Al-Mohammadin, where new settlement units are being built. Mr. Salah also reported that the majority of houses in the Um Rokba area are under threat of demolition and removal, according to notices submitted to them by the Israeli Civil Administration. Israeli forces continued the use of excessive force against peaceful demonstrations organized by Palestinian civilians and Israeli and international human right defenders against the construction of the annexation wall and settlement activities in the West Bank. As a result, dozens of protestors sustained bruises and suffered from tear gas inhalation. Following the Friday Prayer on 28 September 2012, dozens of Palestinian civilians and international and Israeli human rights defenders organized a peaceful demonstration in Bil'ein village, west of Ramallah, in protest at the ongoing construction of the annexation wall. The demonstrators gathered in the streets of the village, with the participation of the Palestinian Counsel in Serbia, Talal Al-Zaq, and a Serbian media delegation, chanting slogans calling for national unity which stressed the need to adhere to the national principles and the right of return, to resist the occupation and to call for the release of all Palestinian prisoners. The protesters raised Palestinian flags and headed towards the Wall. They called through megaphones for Israeli settlers in “Mitityahu” settlement to leave Palestinian land. Israeli soldiers stationed in the area fired rubber-coated metal bullets, sound bombs and tear gas canisters at the demonstrators. As a result, a number of demonstrators suffered from tear gas inhalation and the wounded were treated in the field. Also following the Friday Prayer on 28 September 2012, dozens of Palestinian civilians and international and Israeli human rights defenders organized a peaceful demonstration in Ne’lin village, west of Ramallah, in protest at the ongoing construction of the annexation wall and continuing settlement activities. As a result, some demonstrators suffered from tear gas inhalation, others sustained bruises and the wounded were treated in the field. Same time that Friday, dozens of Palestinian civilians, Israeli and international human rights defenders gathered in Martyrs Square in Nabi Saleh village, northwest of Ramallah, to begin their weekly peaceful protest against the ongoing construction of the annexation wall and continuing settlement activities. The protesters walked towards the gate erected by Israeli forces near the entrance of the village and leading to Palestinian lands that Israeli settlers from the nearby "Halmish" settlement are trying to seize. Israeli soldiers, who had been extensively deployed in the area and near all the entrances of the village since the morning, began to confront the protesters who wanted to walk towards the affected lands. Israeli soldiers fired live and rubber-coated bullets, sound bombs and tear gas canisters at the protesters. As a result, some demonstrators suffered from tear gas inhalation, and others sustained bruises. They were treated in the field. Also at 13:30 that Friday afternoon, Palestinian civilians and international human rights defenders organized a peaceful demonstration in the center of al-Ma’sara village, south of Bethlehem, in protest at the ongoing construction of the annexation wall. They moved towards the entrance of the village. Immediately, Israeli forces fired rubber-coated metal bullets, tear gas canisters and sound bombs at them. Dozens of demonstrators suffered from tear gas inhalation. At approximately 10:00 Saturday morning, 29 September 2012, dozens of Palestinian civilians, international and Israeli human rights defenders and villagers whose lands are threatened by confiscation (Al-Hamra, Al-Twani and Tuba) gathered northeast of Yatta, south of Hebron, to begin their weekly peaceful protest against the Israeli forces's policy of confiscating the villagers’ lands in order to expand its the settlements on the territory of these villages. as a result, Fadel Jibril Bura'I, 46, and Mowahed Ali Al-Shawahein, 19, were injured. The Israeli forces did not intervene to stop the settler violence. At approximately 11:00 on the same day, dozens of Palestinian civilians, international and Israeli human rights defenders, gathered in the Center of Bait Amer village, north of Hebron, for the weekly peaceful demonstration organized against the settlement expansion policy and land confiscation. The demonstrators headed towards Thaher Jalis area near "Kermi Tsour" settlement north of the village. Upon nearing the settlement, Israeli forces immediately fired tear gas canisters and sound bombs at them. Dozens of demonstrators suffered from tear gas inhalation. Due to the number and severity of human rights violations this week, the PCHR made several; recommendations to the international community. Among these were a recommendation that PCHR calls upon the international community to pressure Israel to lift the severe restrictions imposed by the Israeli government and its occupation forces on access for international organizations to the Occupied Palestinian Territories. PCHR reiterates that any political settlement not based on international human rights law and humanitarian law cannot lead to a peaceful and just solution of the Palestinian question. Rather, such an arrangement can only lead to further suffering and instability in the region. Any peace process or agreement must be based on respect for international law, including international human rights and humanitarian law. The United Nations Office for the Coordination of Humanitarian Affairs in the occupied Palestinian territory (OCHA) issued a new report accusing Israel of continuing its serious violations against the Palestinian people, and of preventing access to basic services. OCHA said that the majority of these restrictions were enforced during the first four years of the Al-Aqsa Intifada (September 28, 2000), and added that most of these restrictions are still in place despite the significant improvement of the security situation. Quoting the report, Israeli daily, Haaretz, reported that despite recent easing of certain restrictions on main roads and junctions in the West Bank, Israel is still denying the Palestinians access to basic services, their lands and livelihoods, and that these restrictions are obstructing health and education services, in addition to access to water resources. OCHA said that Israel, as an occupying force, has the moral and legal obligation to provide the Palestinians with the needed services, and has the obligation to ensure they can enjoy their fundamental rights. OCHA further reported that Israel’s settlements in the West Bank are part of the Israeli restrictions and violations that hinder the freedom of movement of the Palestinian people, especially when taking into consideration that Israel’s settlements are illegal under International Law, and are largely built on privately-owned Palestinian lands. As for home demolitions carried out by Israel, OCHA said that %45 of the Palestinian homes that were demolished in the last two years, are located in Area “C” under Israeli security and administrative rule, leading to the displacement of more than 820 Palestinians. Furthermore, OCHA demanded Israel to act and fulfill its international obligations, and to open all central and main roads linking between different Palestinian cities and districts in the West Bank. It also demanded Israel to allow the Palestinians access to areas that became isolated behind the illegal Annexation Wall, and to allow them access to their lands and orchards. OCHA also stated that Israel must lift all restrictions imposed on Palestinian traffic, and to allow the Palestinians full access to the Old City of Hebron and the Jordan Valley. It is worth mentioning that on November 1st, an international committee will be arriving in Palestine to investigate Israel’s settlement activities in the occupied West Bank, including in occupied East Jerusalem, and the impacts of these violations on the Palestinian people. Several Israeli officials previously stated that Israel will not cooperate with the delegates, and claimed that Israel is trying to ease the suffering of the Palestinians, but certain restrictions “are essential” to provide protection for the settlers and the soldiers. Palestinians face serious abuses in the Hamas criminal justice system, including arbitrary arrest, incommunicado detention, torture, and unfair trials. Since it took control of Gaza in 2007, Hamas has executed at least three men convicted on the basis of “confessions” apparently obtained under torture. The 43-page report, “Abusive System: Criminal Justice in Gaza,” documents extensive violations by Hamas security services, including warrantless arrests, failure to inform families promptly of detainees’ whereabouts, and subjecting detainees to torture. It also documents violations of detainees’ rights by prosecutors and courts. Military courts frequently try civilians, in violation of international law. Prosecutors often deny detainees access to a lawyer, and courts have failed to uphold detainees’ due process rights in cases of warrantless arrest and abusive interrogations, Human Rights Watch found. “After five years of Hamas rule in Gaza, its criminal justice system reeks of injustice, routinely violates detainees’ rights, and grants impunity to abusive security services,” said Joe Stork, deputy Middle East director at Human Rights Watch. “Hamas should stop the kinds of abuses that Egyptians, Syrians, and others in the region have risked their lives to bring to an end. The Hamas authorities have failed to investigate and prosecute abusive security officials, and have in practice granted impunity from prosecution to officials in the Internal Security service in particular, Human Rights Watch said. Hamas should urgently reform Gaza’s criminal justice system to end arbitrary arrests, ensure that detainees have prompt access to lawyers, end prosecutions of civilians in military courts, and hold accountable security officials who commit violations, Human Rights Watch said. The executions of people whose confessions were obtained under torture is a clear signal that authorities should immediately impose a moratorium on, if not abolish, the death penalty. Hamas authorities should also promptly, impartially, and thoroughly investigate all credible allegations of abuse in detention. Human Rights Watch interviewed victims of abuses and their families, lawyers, judges, Palestinian rights groups in Gaza, and reviewed case files and court judgments. Witnesses reported that the Internal Security agency, the drugs unit of the civil police force, and police detectives all torture detainees. The Independent Commission for Human Rights, a non-partisan Palestinian rights group that also monitors Palestinian Authority abuses in the West Bank, reported receiving 147 complaints of torture by these three Hamas forces in 2011 alone. In one case Human Rights Watch documented, in August 2008, members of Hamas’s armed wing, the al-Qassam brigades, arrested and tortured Abdel Karim Shrair at an unknown location for three weeks before transferring him to the custody of the police, his family and lawyers told Human Rights Watch. The military prosecutor transferred Shrair to the Internal Security agency, where interrogators tortured him again and prevented him from seeing his family for weeks, the family and lawyers said. Shrair’s mother said that when she was finally able to see him, his legs and face were bruised, his feet were swollen, his hands and arms had rope marks, and his chest had burn marks. The prosecution charged him with collaborating with Israel, in part on the basis of confessions that appear to have been coerced under torture, Human Rights Watch said. His lawyer said that during military court hearings on his case, Shrair had visible bruises and scars and was incontinent. Yet the military courts did not adequately address Shrair’s claims of torture, and held that his arbitrary arrest and detention had been retroactively “corrected” when the al-Qassam brigades transferred him to police custody. A firing squad executed Shrair in May 2011. His mother said that Hamas authorities had prohibited the family from burying him, and that police beat her when she tried to hold his body during the interment. In a meeting with Human Rights Watch on September 26, the deputy director of the Internal Security agency, Mohammed Lafi, said that the agency had a complaints department that dealt with allegations of abuses, but that it had not investigated Shrair’s case because it had never received a written complaint. Human Rights Watch had publicly documented the case in May 2011 and asked the authorities for further information in July 2012, but received no response. In the cases Human Rights Watch examined, the military judiciary did not throw out any criminal cases against detainees because of due process violations, and ignored or failed to investigate credibly detainees’ claims that they had been tortured. Human Rights Watch documented two other cases in which Hamas executed prisoners whom judicial authorities sentenced without adequately reviewing credible claims that their convictions were based on evidence obtained under torture. The authorities in Gaza have allowed the directors of three Palestinian human rights groups ad hoc access to detainees in prisons and at Internal Security detention facilities. Hamas should follow this positive step by ensuring prompt access to detainees by their lawyers, and by regularizing and expanding access to detainees by human rights organizations. The Gaza authorities should also lift their prohibition against access to detainees by the Independent Commission for Human Rights, which Hamas officials have dismissed as biased. Hamas officials claim to have disciplined hundreds of members of the security services for abuses since the group took power in 2007, but Hamas has not made public details about the officials involved or, in many cases, information about the abuses or punishment involved. In meetings in Gaza on September 24 through 26 with officials from the ministries of foreign affairs, justice, and interior, Human Rights Watch urged the authorities to publish verifiable information about accountability for abuses. Most of those disciplined were apparently members of the civil police force. Officials in Gaza told Human Rights Watch that members of the Internal Security agency had been disciplined in a few cases. None of the officials said they knew of any criminal prosecutions of Internal Security officials, despite consistent allegations of severe abuse. Lafi, the deputy Internal Security director, said that four Internal Security officers had been demoted by one rank or a half-rank and transferred elsewhere after the death in custody of Nihad al-Dabaki in February 2009. An internal investigation found that al-Dabaki had died as a result of cold and his poor health, officials said. However, investigations at the time by the Independent Commission for Human Rights stated that its field workers observed “clear marks of torture” on al-Dabaki’s body. In another case, ‘Adel Razeq died in Internal Security custody in April 2011. Lafi said that after an investigation, the Internal Security agency fired an official who had exceeded his authority by slapping Razeq to rouse him after he had fallen onto a chair and injured himself. However, family members told Human Rights Watch that Razeq’s body had bruises on the head and legs, and broken ribs, that he had been arrested without a warrant, and that they had been unable to meet with him in detention. Former detainees who alleged they were abused by security services told Human Rights Watch that they despaired of finding justice. Several were afraid to describe what had happened to them in custody, even on condition that their identities would be kept confidential. Some men said they had needed medical care due to torture and sought to obtain medical records as evidence that they had been tortured, but that hospital officials refused to provide them. Hamas’s rival in the West Bank, the Fatah-dominated Palestinian Authority, arrests and detains Palestinians arbitrarily, including Hamas members or sympathizers, and similarly subjects detainees to torture and abuse. The intra-Palestinian political rivalry remains a significant factor behind many Hamas abuses against detainees in Gaza, Human Rights Watch found. Some of the Gaza abuse cases documented were against people detained on suspicion of collaborating with Israel or the Palestinian Authority in the West Bank. Collaboration is a serious crime under Palestinian law, but suspicion of collaboration does notjustify torture or other abuse. Human Rights Watch’s findings are also consistent with increasing reports of abuse by security forces in Gaza against detainees accused of non-political crimes, including people accused of drug offenses and fraud. Human rights lawyers in Gaza said that they have continued to receive the same kinds of allegations of abuse from victims since Hamas and Fatah announced a political reconciliation in May 2011. The abusive practices of Hamas’s security services flout human rights norms that Hamas has pledged to uphold, Human Rights Watch said. These practices also violate Palestinian laws that require police to obtain judicial arrest and search warrants, and prohibit torture and the use of evidence obtained under torture. Hamas grew out of the Palestinian wing of the Muslim Brotherhood. Human Rights Watch said that Egypt’s Muslim Brotherhood, whose political arm holds the country’s presidency, should pressure Hamas leaders to end the kinds of abuses, including arbitrary detention and torture, that they themselves suffered under former president Hosni Mubarak. Hamas should urgently reform Gaza's criminal justice system to end arbitrary arrests and ensure detainees have prompt access to lawyers, Human Rights Watch said Wednesday. Hamas' Internal Security agency, the drugs unit of the civil police force, and police detectives all torture detainees, according to the Independent Commission for Human Rights, which says it received 147 complaints of torture from these three units in 2011. The executions of people whose confessions were obtained under torture is a clear signal that authorities should immediately impose a moratorium on, if not abolish, the death penalty, Human Rights Watch said. Hamas authorities should also promptly, impartially, and thoroughly investigate all credible allegations of abuse in detention, it said. A day earlier the European Union condemned the use of capital punishment in the Gaza Strip and urged the Hamas government to refrain from executing prisoners. "Abusive System: Criminal Justice in Gaza," a new report from Human Rights Watch, documents violations by security services, including warrant-less arrests, failure to inform families promptly of detainees’ whereabouts, and subjecting detainees to torture. "After five years of Hamas rule in Gaza, its criminal justice system reeks of injustice, routinely violates detainees’ rights, and grants impunity to abusive security services,” said Joe Stork of Human Rights Watch. "Hamas should stop the kinds of abuses that Egyptians, Syrians, and others in the region have risked their lives to bring to an end," he said. The release of the report came as the Gaza Ministry of Interior said it would launch an inquiry into complaints by journalists against reporting restrictions in the coastal enclave. Interior minister Fathi Hammad issued the decision to form the committee, ministry spokesman Islam Shahwan said. He called on the media to cooperate with the committee. Hammad has given clear instructions that the work of journalists and media organizations must not be hindered in Gaza, Shahwan added. On Sunday, a Palestinian press freedom group warned of restrictions and abuse of journalists in the Gaza Strip during a rare demonstration criticizing the Hamas government for negligence in a fire which killed a three-year-old boy. "We often receive threats when we cover sensitive events. I'm calling on Palestinian authorities to provide a safe working environment for journalists," journalist Husien Jamal said. In another incident, AFP photographer Mohammed Albaba told Mada that internal security officers prevented all journalists from covering a rally by women calling for political unity. Some of the laws also violate the rights of Palestinians living in the 1967 OPT and Palestinian refugees. You can also see Adalah's Brief on Discriminatory Laws and Bills Since 2009.